There are at least three major types of writing. The first might be called Shakespeare’s method, which includes the telling of stories with deep symbolic and archetypal lessons. Many of the great world religious texts used this approach. The Greeks referred to this as poetry, though the meaning of “poetry” is much more limited in modern usage. In the contemporary world we often call this type of writing fiction, though this is a misnomer since the stories used are not actually untrue—they are, many of them, literally true, and nearly all of them are symbolically true. This could also be called the Inspirational style of writing. A second kind of writing can be summarized as Tocqueville’s method, or the philosopher’s style. Called prose, non-fiction, or editorializing, this type of literature consists of the author sharing her views, thoughts, questions, analyses and conclusions. Writers in this style see no need to document or prove their points, but they do make a case for their ideas. This way of writing gave the world many of the great classics of human history—in many fields of thought spanning the arts, sciences, humanities and practical domains. This writing is Authoritative in style, meaning that the author is interested mostly in ideas (rather than proof or credibility) and writes as her own authority on what she is thinking. The third sort of writing, what I’ll call Einstein’s method, attempts to prove its conclusions using professional language and appealing to reason, experts or other authority. Most scientific works, textbooks, and research-based books on a host of topics apply this method. The basis of such writing is to clearly show the reader the sources of assumptions, the progress of the author’s thinking, and the basis behind each conclusion. Following the scientific method, this modern “Objective” style of writing emphasizes the credibility of the conclusions—based on the duplicable nature of the research and the rigorous analysis and deduction. There are few leaps of logic in this kind of prose. Each type of writing has its masters, and all offer valuable contributions to the great works of human literature. This is so obvious that it hardly needs to be said, but we live in a world where the third, Objective, style of writing is the norm and anything else is often considered inferior. Such a conclusion, ironically, is not a scientifically proven fact. Indeed, how can science prove that anything open to individual preference and taste is truly “best?” For example, such greats as Churchill, Solzhenitsyn and Allan Bloom (author of The Closing of the American Mind) have shown that “Tocqueville’s” style is still of great value in modern times—as do daily op eds in our leading newspapers and blogs. Likewise, our greatest plays, movies and television programs demonstrate that the Shakespearean method still has great power in our world. That said, David Brooks’ new book The Social Animal: A Story of Love, Character and Achievement manages to combine all three styles in one truly moving work. I have long considered Brooks one of my favorite authors. I assigned his book Bobos in Paradaise: The New Upper Class and How They Got There as an undergraduate and graduate college text for several years, and I have recommended his book On Paradise Drive to many students and executives who wanted to understand American and modern culture. In one of the best descriptions of our society ever written, he outlined the new realities experienced by the “average” American citizen, who he called “Patio Man.” I have also enjoyed many of his editorials in The New York Times—and the ongoing, albeit unofficial and indirect, “debate” between his columns and those of Thomas L. Friedman, Paul Krugman, George Will and, occasionally, Peggy Noonan. The Social Animal is, in my opinion, his best work to date. In fact, it is downright brilliant. I am not suggesting that it approaches Shakespeare, of course. But who does? Still, the stories in The Social Animal flow like Isaac Asimov meets Ayn Rand. It doesn’t boast deep scientific technical writing, as Brooks himself notes. Indeed, Brooks doesn’t even attempt to produce a great Shakespearean or scientific classic. But he does effectively weave the three great styles of writing together, and in the realm of philosophical writing this book is similar to Tocqueville’s Democracy in America. The content of the book, in fact, is as close as we may ever see to a 21st century update to Tocqeville (1830s) and Bryce (1910s). I know this is high praise, and in our modern era with its love of objective analysis, such strong language is suspect in “educated” circles. But my words are not hyperbole. This is an important book. It is one of the most important books we’ve seen in years—probably since Fareed Zakaria’s The Post-American World or Daniel Pink’s A Whole New Mind. This book is in the same class as Bloom’s The Closing of the American Mind, Huntington’s The Clash of Civilizations, Strauss and Howe’s The Fourth Turning, or Philip Bobbitt’s The Shield of Achilles. It is as significant as any article in Foreign Affairs since Richard Gardner’s writings. It reads like Steven Pinker channelling Alexis de Tocqueville. The language is, well, beautiful, but beautiful in the modern sense, like the writings of Laura Munson or Sandra Tsing Loh. The book also manages to bridge political views—I think liberals will find it moving and conservatives will find it convincing. It is not exactly Centrist, but neither is it patently Right nor Left. It will appeal to independents and people from all political perspectives. If it has a political leaning, it is the party of Common Sense—backed by meticulous research. “Over the centuries, zillions of books have been written about how to succeed. But these tales are usually told on the surface level of life. They describe the colleges people get into, the professional skills they acquire, the conscious decisions they make, and the tips and techniques they adopt to build connections and get ahead. These books often focus on an outer definition of success, having to do with IQ, wealth, prestige, and worldly accomplishments. “This story [The Social Animal] is told one level down. This success story emphasizes the role of the inner mind—the unconscious realm of emotions, intuitions, biases, longings…. The Social Animal struck a personal note with me because it brilliantly describes the true process of great mentoring that more of our teachers need to adopt and that I wrote about with Tiffany Earl in our book The Student Whisperer. I have seldom seen truly great teaching described better. We still have admissions committees that judge people by IQ measures and not by practical literacy. We still have academic fields that often treat human beings as rational utility-maximizing individuals. Modern society has created a giant apparatus for the cultivation of the hard skills, while failing to develop the moral and emotional faculties down below. Children are coached on how to jump through a thousand scholastic hoops. Yet by far the most important decisions they will make are about whom to marry and whom to befriend, what to love and what to despise, and how to control impulses. On these matters, they are almost entirely on their own. We are good at talking about material incentives, but bad about talking about emotions and intuitions. We are good at teaching technical skills, but when it comes to the most important things, like character, we have almost nothing to say. There are so many more gems of wisdom. For example, Brooks notes that in current culture there is a new phase of life. Most of today’s parents and grandparents grew up in a world with four life phases, including “childhood, adolescence, adulthood and old age.” Today’s young will experience at least six phases, Brooks suggests: childhood, adolescence, odyssey, adulthood, active retirement, and old age. While many parents expect their 18- and 19-year-old children to go directly from adolescence to the adult life of leaving home and pursuing their own independent life and a marriage relationship, their children are surprising (and confusing) them by embracing their odyssey years: living at home, then wandering, then back home for a time, taking a long time to “play around” with their education before getting serious about preparing for a career, and in general enjoying their youthful freedom. Most parents are convinced they’re kids are wasting their lives when in fact this is the new normal. Most odysseys pursue life in what Brooks calls The Group—a small team of friends who help each other through this transition. Members of a Group talk a lot, play together, frequently engage entrepreneurial or work ventures with each other, and fill the role of traditional families during this time of transition. Even odysseys who live at home for a time usually spend much of their time with their Group. This book is full of numerous other ideas, stories, studies, and commentaries. It is the kind of reading that you simply have to mark up with a highlighter on literally every page. Whether you agree or disagree with the ideas in this book—or, hopefully, both—it is a great read. Not a good read, but a great one. Some social conservatives may dislike certain things such as the language used by some characters or the easy sexuality of some college students, and some liberals may question the realistic way characters refuse to accept every politically-correct viewpoint in society—but both are accurate portrayals of many people in our current culture. The Social Animal may not remain on the classics list as long as Democracy in America, but it could. At the very least, it is as good a portrayal of modern society as Rousseau’s Emile was in its time. It provides a telling, accurate and profound snapshot of American life at the beginning of the 21st Century. Reading it will help modern Americans know themselves at a much deeper level. This is a book about many things, including success and happiness as mentioned above. But it is also a classic book on freedom, and on how our society defines freedom in our time. As such, it is an invaluable source to any who care about the future of freedom. Read this book to see where we are, where we are headed, and how we need to change. The Social Animal is required reading for leaders in all sectors and for people from all political persuasions who want to see freedom flourish in the 21st century. 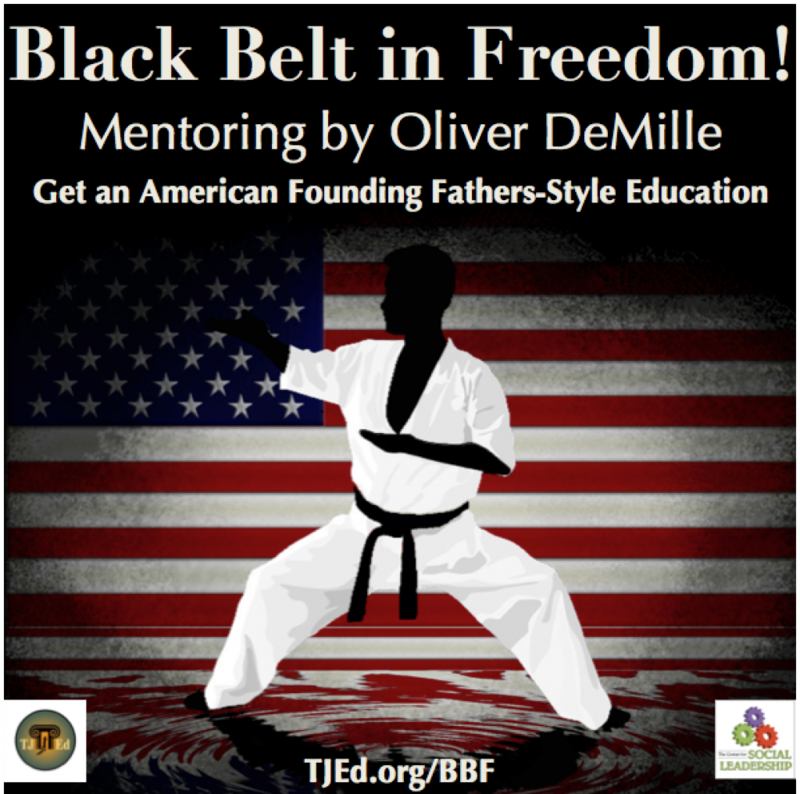 Oliver DeMille is a co-founder of the Center for Social Leadership, and a co-creator of Thomas Jefferson Education. He is the co-author of the New York Times, Wall Street Journal and USA Today bestseller LeaderShift, and author of A Thomas Jefferson Education: Teaching a Generation of Leaders for the 21st Century, and The Coming Aristocracy: Education & the Future of Freedom. A new tribe is needed. Actually, its constituents have been around for a long time. But they have functioned as individuals, sometimes as families, and more rarely as small groups of people. But as a tribe or nation, it has never gained traction or achieved critical mass. Such a tribe believes in freedom, real freedom, for all people in an ordered society that protects liberty for everyone. This ideal has been proposed by many, and fully achieved by no nation in history. The American founders promoted it—but even they fell short. Perhaps an isolated tribe or two have accomplished it; but such events are recorded as scripture, myth or legend rather than meticulously documented history. For the rest, it remains an illusive utopian dream. Three of the biggest challenges of our time—the need for a revolution of entrepreneurship, the need for more independent-thinking citizens, and the need for more leadership in the emerging e-tribes and other new-style tribal groups of the world—all unite in their call for the growth of a new tribe dedicated to freedom. One of the major reasons the tribe of freedom has seldom achieved power in the world is that human beings naturally tend to break into competing groups—but without dividing on the true lines of difference. Madison outlined the benefits of this tendency in Federalist 10, and there are many positives of factionalism that have contributed to American freedom. But there is also a major downside. Tocqueville taught in Democracy in America that every nation divides itself into two major parties, each competing with the other for ascendency. He called these the party of aristocracy and the party of democracy—one seeking to divide the people according to class, and the other attempting to spread equality. In America these became the party of agriculture versus industry, then North versus South, later the city versus the country, and most recently Democrats versus Republicans. But dividing the nation into red and blue states (or liberal coasts versus conservative flyover states) misses the real division among us. Ancient divisions between aristocrats and peasants, as well as medieval conflicts between feudal lords and neighboring states, made the same mistake. When war arose in history, re-alignment into Hawks and Doves also missed the point. So did historical conflicts over the color of roses and violent arguments between religions. Our historical and modern divisions are not the real divisions, and this means that the battles go on for all of history without conclusion or solution. To end the conflicts, to fix the unending battling of sides, we need to clearly understand the two sides as they really are—the real parties. Unlike elementary or high school culture, and unlike college, career and even adult culture, the real divide takes us all the way back to kindergarten. Indeed it is one of those key lessons that we all should have learned in early childhood. In some ways (as humorously recounted by author Robert Fulghum), the lessons of kindergarten are the most important of all. The divide of all humankind can be understood in the most basic terms: Some people spend their lives angry and afraid, while others live in the attitudes of hopeful and helpful. These are the basis of the real world schism. The Scarcity Party sees a world of battling, competition, scarcity, winning or losing, and always trying to get ahead. It is the party of predators and victims. Its members see others as either potential mates or potential enemies. They quickly notice differences between people, and they seek to get themselves and those in their group (family, race, religion, faction, nation, etc.) ahead of everyone else. They want others to lose more, and for their own to win more. In their anger and fear, they avoid pain, push for whatever they think will benefit them, and are willing to step on others to get what they want. The Angry & Afraid Scarcity Party (A²) has a long and sad history of causing, escalating and reliving most of the problems in world history. In contrast, the Helpful & Helpful members of the Abundance Party (H²) spend their lives trying to help people, improve themselves, and seek better lives and a better world. Because they are not afraid, it is fine with them if others don’t support them or do something different. They are secure. For the Abundance Party, life is not about themselves. Yes, it is about becoming better; but even this goal is a merely a means to helping the world improve. If they were angry, they would expect everyone else to join them in fixing the world, and even try to use the force of government to require charity. But they are content to do their own work of improving the world and helping others, inspiring and urging them to be and do their best through exemplary leadership, rather than expend angry energy trying to force others to change. Pretty much every nation, organization, philosophy, political viewpoint, religion, community, company and family has both A²s and also H²s. The H² Partiers do nearly all of the good in these groups, while the A²s cause nearly all the problems. If the H²s from all groups would work together, the mischief of the A²s would soon be mitigated. But as it is, the H²s constantly find themselves in superficially adversarial positions from each other (due to their institutional affiliations) even though such conflict is not their purpose or their nature. Ironically, if you have strong Democratic ties it is tempting to call Democrats the Hopeful & Helpful and label Republicans the Angry & Afraid; those with loyal Republican connections assign the opposite labels. But neither type of labeling is truly accurate. There are a lot of H²s and A²s in both major political parties. The H²s and the A²s make up all the members of the Democrats, Republicans, independents, socialists, environmentalists, right-wingers, radical leftists and every other political group. If you know what to look for, they are pretty easy to recognize. The A²s include those who are any of the following: Bush-haters, Obama-loathers, racists, bigoted about religious or secular beliefs, promoters of violence in modern America, etc. Republicans like to point out the Angry & Afraid people in the Democratic Party and act as if they speak for the whole party, and the Democrats do the same thing when attacking Republicans. An interesting hybrid also exists, which is likewise problematic. Historically, too many Democrats have combined Afraid and Helpful, while too often Republicans have been Angry and Hopeful. Unfortunately, the internal conflict and the philosophical and operational inconsistencies of these amalgams basically cancel out the good they could do to truly promote freedom and make a difference for good. The world needs more hopeful and helpful people, and the future of our freedom and prosperity depends on it. The strong emotions of anger and fear too frequently block the path to progress. However, before we can fully understand the differences between these two major Parties of the A²s and the H²s, and the application of this construct, we need to understand the eight meanings of freedom. The seventh and eighth freedoms are actually forms of protection. A seventh freedom, national security, consists of using power to defend these other freedoms from aggressors and attackers. And social justice, an eighth freedom, is the process of ensuring that these other freedoms are truly available to all people—not just to a limited few from a certain class, race, or other group. However, the more reasonable and normal definition of social justice (and national security) is essential to freedom: to take constitutional freedoms to all. True liberty requires all eight types of freedom. Anything less falls short (although any measure of freedom is certainly better than none). Indeed, a society which increases one of these freedoms is nearly always headed in the right direction. And, in fact, each freedom tends to promote the adoption of the other seven. For example, increased academic freedom or freedom of the press naturally encourages the spread of political and economic freedoms—and vice versa. Freedom promotes freedom, just as force encourages the increase of force. Fighting each other over which column is most important is misguided and dangerous. It has seldom brought anything but pain to our nation and its citizens. Such a view is highly inaccurate, and comes from fear, anger and a deep lack of trust. While it is true that the Angry & Afraid types within the other Party will continue to cause negatives, it is more important to notice that the Helpful & Hopeful folks on the other side are truly trying to make the world better. Whatever you may think about the “other” party, an important segment of both Republicans and Democrats are actually H². Many independents and entrepreneurs are naturally inclined to the H² perspective. As more people think about politics in a non-partisan and increasingly independent way, and as more people become entrepreneurs and develop leadership skills like greatly increased initiative and tenacity and so forth, the H² viewpoint will continue to spread. Unfortunately, in politics, Republicans and Democrats often vehemently promote the four freedoms they value most and simultaneously discount or attack the other four. Other parties and many independents make the same mistake. For example, some conservatives frequently denigrate the freedoms of privacy or the press in their attempts to promote religion, while some liberals too often trample economic or political freedoms in their zeal to increase social justice. Likewise, conservatives sometimes deny social justice when political and economic freedoms are not really at stake, just like liberals at times refuse to allow religious freedom or incentivize the power of the private sector out of fear that social justice must be an exclusively government project. Both sides engage battles for their pet types of freedom, and then don’t turn off the fight even when the other side suggests something truly positive. All of this is the natural result of the Angry & Afraid worldview. In reality, the Hopeful & Helpful people in both the Democratic and Republican Parties, as well as the H² independents and members of minor parties, really do care about all eight freedoms. Some have been inclined to focus on certain freedoms above others, either by their upbringing, education or party affiliations, but those with an H² outlook are friends of all eight freedoms. This chart is remarkably different than the one we saw earlier, and it illuminates the major difference between the fundamental values and attitudes of the two real parties—the A² and the H². Their views of the past, current issues, and visions for the future could hardly be more divergent. Both groups of course include pessimistic and also idealist people, and there are various different schools of thought in both. But the most significant factor separating these two great Parties of humanity is their worldview. The Hopeful & Helpfuls value their own ability to contribute to the world, while the Angry & Afraids see themselves as victims of a powerful “they” which is to be opposed, feared and hated. The H2s see that all six of the basic freedoms are vital, that social justice spreads these six freedoms, and that national security protects and maintains them. Together, all eight freedoms are essential for a healthy, free and prosperous society. Our nation and world desperately needs a Party of Freedom. Such a party would not be an official political party, since its goal would be to unite and build rather than to win or govern. It would be made up of everyone who believes in all eight facets of freedom, and that we can work together to promote them, increase and spread them, and keep them protected and safe in a dangerous world. It would be full of people who approach the world in an attitude of hope and help. The idea of a freedom party is made realistic by the technology of the day, which allows people from all places and walks of life to connect and cooperate. Such a party would have a higher-than-usual makeup of entrepreneurs, creeds and backgrounds. The one thing they would share in common is a belief in the essential value of all eight meanings of freedom. Certainly such a tribe would have its share of debates, factions, and disagreements, all of which are healthy to freedom. The guiding value would be that any proposal, policy or plan they supported would be good for freedom overall—not just good for one type of freedom at the cost of another. We need a freedom party in our day, an unofficial tribe of people working together on the shared vision of more freedom for all people in each nation of the world. Of course, given the reality of our modern world, such a party does not need to be a single, organized entity with bylaws and officers. In fact, freedom will benefit most if a host of people simply promote the eight types of freedom in the organizations and groups they already support. An informal freedom party made up of many diverse people and tribes that share the philosophy of full freedom with all the other groups and peoples. An understanding that when we promote one type of freedom at the expense of another we actually hurt us all. A commitment to more openly look beyond our own limited opinions and cooperate with people of differing views who truly do care about freedom. Without all of these, freedom will struggle and decline. For those who love freedom, it is time to broaden and deepen our understanding of true freedom. It is time to use our influence to spread the values and ideas of freedom. The technology is there, and it is time to use it. Real freedom has always been a bottom-up project led by the regular people in a society. All eight facets of freedom are essential, and it is up to the regular people to promote them all. This is the future of freedom, and it depends on each of us.